The game lab is now accepting applications for the 2018-2019 academic school year! Please make sure to read the directions carefully as you go through the application process. If you have any questions, feel free to contact the Game Lab Head Moderator, Nathon Rodrigues (dpugamelab@gmail.com or Ani-Nate#5693 on Discord). Link to the application form is below. Hello and welcome back! Hope you all enjoyed a long and relaxing winter break and are easing back into your school routines nicely. Our first event of the winter quarter will be coming up this Friday! Come on out for our “Holiday Noob Night” in CDM 924 starting at 6PM! This event will be focused on playing any video games you received over the holiday break that you are willing to share and play with other members of DeFrag. However, you are responsible for the games you bring. On the other hand, if you don’t have any games to bring, we’ll have some of the newest releases of 2017/2018 for everyone to play as well (including Marvel v. Capcom: Infinite). Along with our first event we will also be giving out information for board recruitment! If you enjoy going to DeFrag events and have always wanted a say in the organization of our events, or have new ideas you think you could contribute to the club, then consider applying for DeFrag board! Hope to see you all there this Friday! The end of fall quarter is creeping upon us, and that means it’s time for DeFrag’s bi-annual Geek Til’ Dawn event! The one event we’ve all been waiting for! This time around the theme is Generations, in celebration and honor of DeFrag’s past, present, and future. Check in for this event will begin at 6PM in the CDM lobby. Be sure to get there and check in by 11PM, as that’s when the building closes. Also, be sure to stop by 924 at 8:30PM for announcements. This year’s big raffle prize is a SNES Classic! The tournaments this year will consist of games such as Pokémon and Overwatch! We are also having a movie room that will screen various different animes. As per usual, we will have board games all night in 924, as well as video games in the game lab, pizza during the night, and Dunkin Donuts in the morning! Be sure to stop by 924 by or before midnight as that is when we will do the raffle drawing! We will also be selling Geek Til’ Dawn posters for this event in 924 throughout most of the night. So feel free to stop by and buy one! There will also be a PowerPoint with this schedule in 924 with room information too. Please keep in mind this is an overnight event, so we have a few additional rules that must be followed as a result. 1. Registration is required. All students must either register at the event or preferably beforehand on OrgSync. 2. Non-DePaul guests are allowed, but only one per student. Guests must also be registered at the main lobby table and must remain with the person who registered them at all times. 3. Everyone must wear the wristbands provided at registration. On the day of the event at the registration desk, each student and guest will be given a color wristband that must remain on them at all times during the event. 4. All students and guests must remain on the 9th, 7th, 5th and 2nd floors. All other floors are strictly off-limits after the building closes at 11. If anyone is caught in violation of these rules they will be removed from the building. As long as everyone follows these simple rules though, we shouldn’t have any problems! Hope to see you all there on November 10th! Join us this Friday starting at 5:30PM in the Daley building’s theatre (room 214) to watch the Super Mario Bros. live action movie followed by Sonic The Hedgehog! Food will be provided from Chartwells. Hope to see you there! Come on down to CDM 924 for a night of competition and gaming! We will be holding our DeFrag Masters event starting at 6PM (similar to Pokémon Masters if you’re familiar with that). Challenge the board members of DeFrag and see if you have what it takes to beat them at their self-proclaimed best (or favorite) game, while also competing with other general DeFrag members for all the pride and glory. Rack up stars as you go around to each game and successfully defeat each DeFrag master, and come out on top as The One True Holy DeFrag Member. We will bow down in your presence. Our first event of the school year went over smoothly and everyone seemed to have a good time! Thanks to those folks who came out to it! We hope to see returning and maybe even some new faces for our second event. In the confines of CDM, through the labyrinth like halls of its most deepest, darkest basement lied a dusty old machine whose technology was unknown of to this world. Discovered by the members of DeFRAG it was determined that this piece of technology was in fact a Time Machine. Though still humming with power, they made note of its fading crystal powering the machine. It appears there would be only one more use before this machine would be no more… That night they all agreed they would need to make this last charge count, whether it be them going back in time to stop a chatastrophic event, learning of an ancient mystery of the world once believed to be lost, or even save the world from doom. As such, it was decided what its last use would be put for. To play video games from our childhood. Come on down to CDM 924 from 6PM to 9PM and enjoy a night of playing the games of our childhoods some of which include: Crash Team Racing, Halo 3, and much more! There WILL be an after party, more details at the event. Hope you can make it in time! Welcome back to a new school year of social gaming! We hope you all had an enjoyable summer. For our first event, we’ll be having a trivia night at the CDM building (room 924) this Friday night starting at 6PM! Bring some friends along, or make some new ones while forming a team and working together to solve questions about video games created by our board members! We look forward to seeing you there! Check in starts at 6pm in the CDM lobby, and be sure to do so by 11pm as that’s when the building closes. Also, be sure to stop in 924 at 8:30 for announcements! This year the raffle prizes are a Nintendo Switch with Mario Kart 8 (and neon joycon controllers! ),Injustice 2, and Super Mario Bros Movie and a Fedora!! This year’s tournament will consist of games such as; super smash bros, Mario and Sonic in the Olympic Games, Overwatch and more! We are also having a movie room with some classic movies such as Train to Busan, Civil War, Fast n Furious, Alien vs Predator! As per usual we will have board games all night in 924 as well as video games in the game lab, pizza during the night and dunkin doughnuts in the morning! *be sure to stop by 924 before 12 as that is when we do the raffle drawing!! 3DS/Slumber Party Room: 6:00-ALL NIGHT! Game Dev Open Workspace: 6:00-ALL NIGHT! Please keep in mind this is an overnight event and we have a few additional rules that must be followed as a result. 2. Non Depaul guests are allowed, but only one per student. Guests also must be registered at the main lobby table and must remain with the person who registered them at all times. If anyone is caught in violation of these rules they will be removed from the building. As long as everyone follows these simple rules though, we shouldn’t have any problems. Hope to see you all there on May 26th! 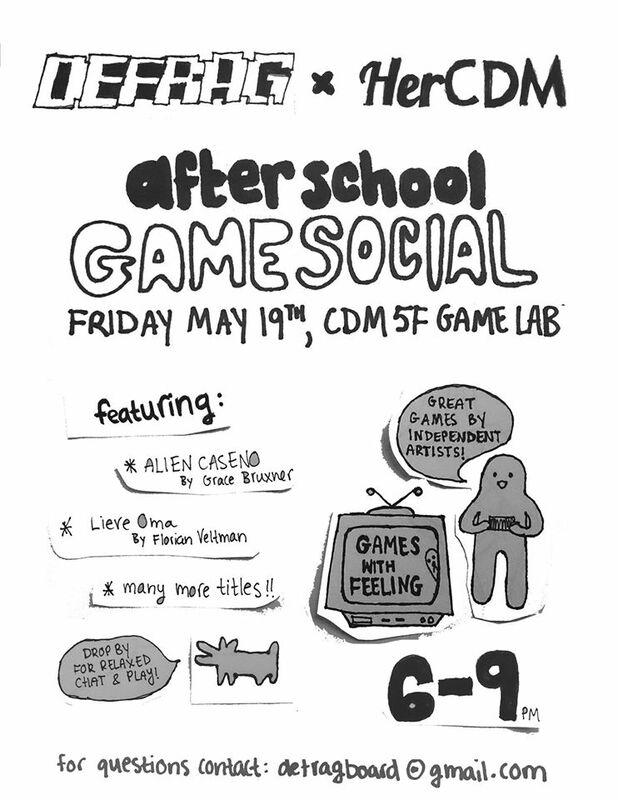 THIS FRIDAY- Defrag + HerCDM Afterschool Game Social!! Wahoo!! DeFrag & HerCDM are teaming up to bring you a savory helping of independent games that’ll give ya a real feeling! We’re offering up a mere slice of the awesome games out there that are challenging our medium and giving it more depth, strength, and sincerity. Laugh, listen, maybe yell a little, and chat, as we play games and relax in the game lab from 6-9PM this Friday! Feel free to stop by for a few minutes or a few hours. Play somethin’ new, meet someone new. All of the games here heavily emphasize experience over skill or competition, so no worries, no pressure. All events will be taking place in the CDM building in the Loop Campus unless specified otherwise.